So maybe you've recently upgraded your Android phone and haven't gotten used to the new device's button alignment yet... or maybe you never use that pesky Search key and want to turn it into the camera key your EVO 4G has always wanted... or maybe you just enjoy tinkering with your phone. If you're in one of those situations, what you may be lusting after is a way to remap your phone's hardware buttons (i.e. making the Search key take on the duties of the Home key, or vise versa). Up until now, there haven't been any user-friendly methods of doing this, at least not any that can be so greatly customized. 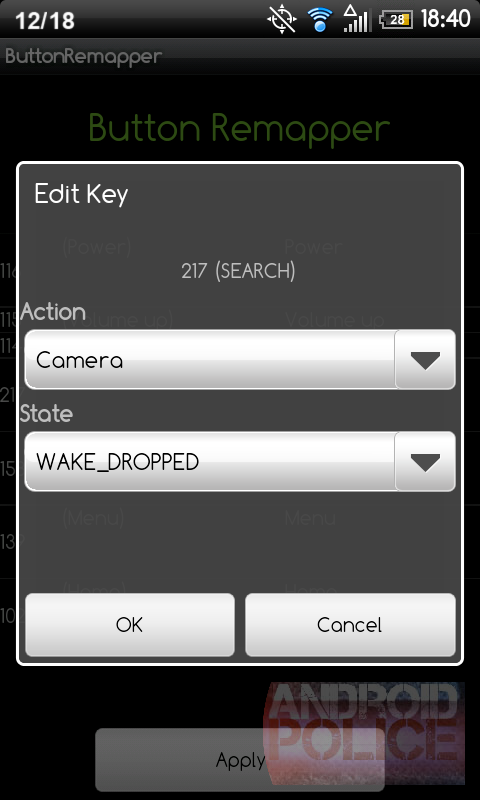 Well, the deprivation is over - Beansoft (also known as appelflap around the XDA-Developers forums) has developed the handy ButtonRemapper app, which provides users a simple-as-can-be way of remapping the staple Android buttons (Home, Menu, Back, and Search). The app does more than that, however - read on for the full story. After you switch the buttons' functions and apply your modifications, your phone will perform a "hot reboot," a sort of partial reboot which takes roughly half the time of a full system restart. 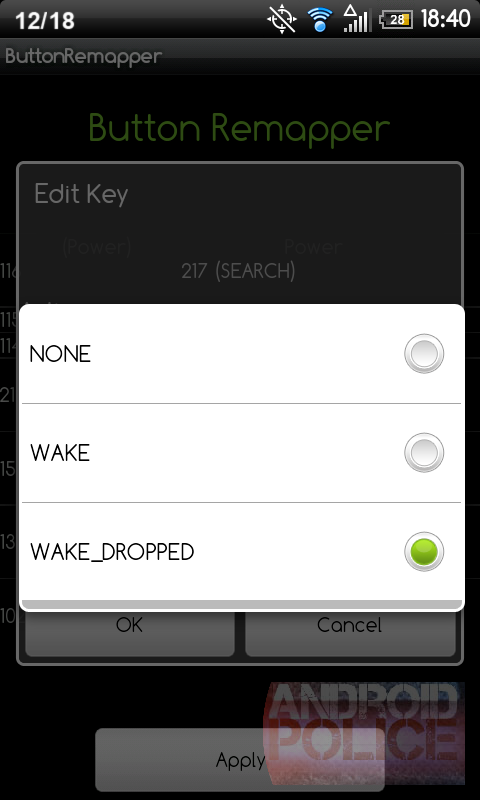 The app also offers the ability to change each button's state - you can choose from "NONE," "WAKE," and "WAKE_DROPPED." The second of the modes presumably allows the button to function even when the device is in sleep mode, while the first and third should limit the button to functioning exclusively when your phone is awake. Strangely enough, I haven't observed any change in the buttons' behavior after switching these states, though this could just be my EVO. 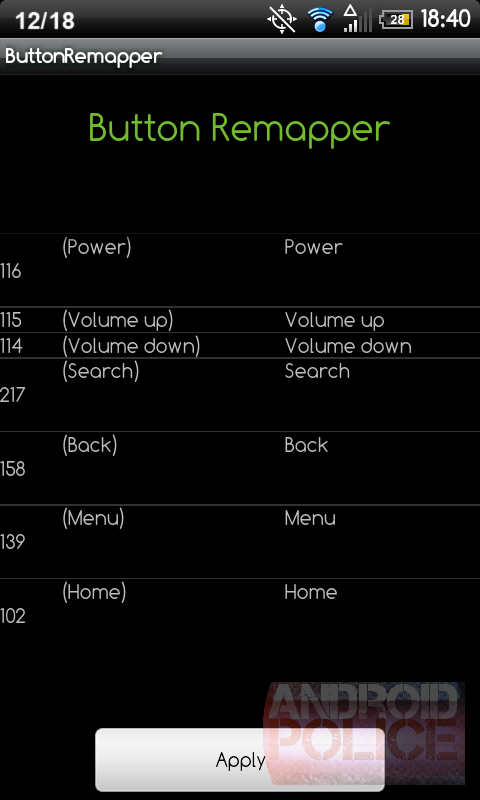 As an added bonus for tech-savvy users, Beansoft has included the buttons' code numbers so as to make it easier for interested parties to modify the keys' functions the longhand way (i.e. editing the key layout map file, which is explained in detail here). Even more helpful is Beansoft's own KeynrTracker application, which can be downloaded from here. If you're using a Galaxy Tab, you'll have to download a special version. Unfortunately, the Motorola Droid 2 and Huawei U8110 are not supported at the time of this writing. The version of the app you'll find in the Market is a paid, $0.99 donation edition. Beansoft is also offering the app free of charge for those who find it in the XDA forums. Of course, no matter how great an app is at remapping buttons, there's always going to be one relatively huge issue: the fact that the functions of the buttons won't align with the actual labels on the keys. While this won't be an issue if you're like me and you don't even look at the button you're pressing, it means Android newbies might want to stay away from this app. Nonetheless, if you're switching Android phones (i.e. buying a Droid X after owning a Droid Eris for a while) and don't want to waste time getting used to a new button alignment, ButtonRemapper is certainly worth a look. You know what to do - QR codes, AppBrain links, and more are patiently awaiting your click/scan below.